Like Nanos over the past few days, Ipsos for Global has seen an erosion of NDP support in all-important Québec and Ontario: the NDP is down 5 points and 3 points respectively in these provinces. 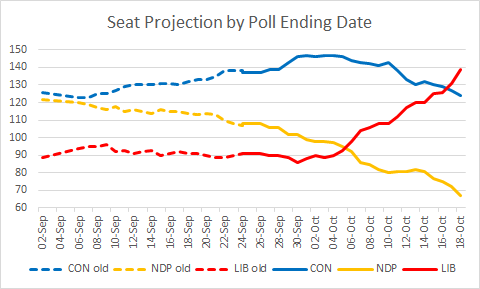 And now that Nanos has the NDP at 30% and Ipsos has it at 29% in Québec, the 28% from Léger last week no longer looks like an outlier. 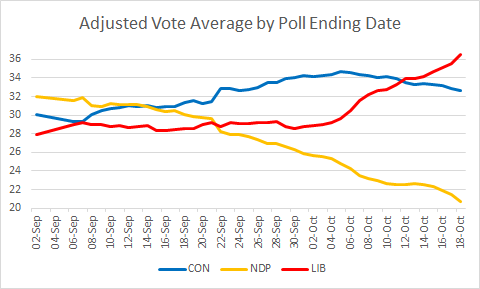 Also, while the Tories took a one-point lead nationally (compared to a one-point Liberal lead last week), the Liberals took a three-point lead in ON (compared to a one-point Tory lead last week). 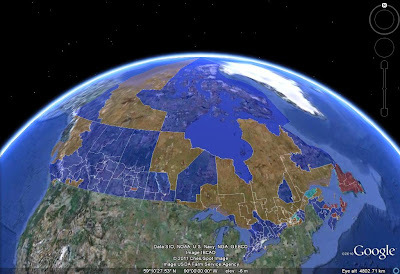 This projection gives the NDP 47 seats in Québec on 31.2% of the vote. But if it is really in the 28-30% range, it would likely get 30-40 seats instead.